Mary, Mary, kwite kontrary, how does your garden grow? With silver bells, and kockleshells, and a red background with white spots all over. 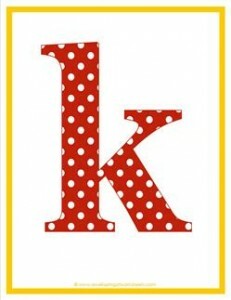 Gotta love polka dot lowercase k! Please go to this page to see all the lowercase polka dot letters in this set. Polka dot letter graphics from Digital Field.